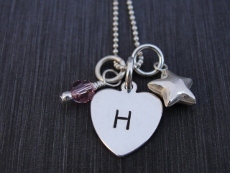 Our smallest sterling silver heart charm necklace is stamped with your favorite intials. The charms are hung on a sterling silver ball chain in 16", 18" or 20" lengths. To order this item, please select a style, initial ,spacer or no spacer. Then click Add to Shopping Cart button. 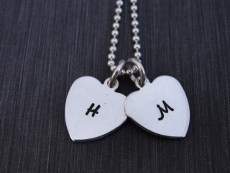 Hip Tip: Layer this necklace with our personalized necklace to keep all your loved ones close.